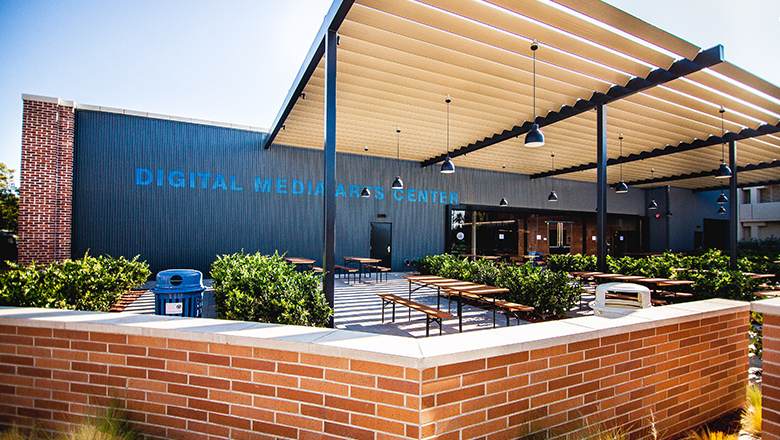 The 18,000 square-foot Digital Media Arts Center is a working, industry-standard studio inspired by the spaces built for creative giants such as Pixar, Disney, Microsoft and Google. Collaborative spaces include a coffee bar, relaxed indoor lounge, communal table, and a large outdoor patio area. This building features a 2D Animation Lab, which allows hand drawn technique and animation to be done directly on the computer screen; a traditional art studio to hone your drawing and design skills; and erasable walls that allow for free drawing and sketches which greet you as you come into the building or enter a classroom. The Digital Media Arts Center provides students with access to the very latest technology so that you are well-prepared to work as professionals on Hollywood’s most technically sophisticated projects. But don't take our word for it. Schedule a tour to visit Dodge College and find your creative space. A 32-workstation dual monitor digital arts computer lab with 22”HD cintiq drawing surface and ergotron extension arm. A 25-workstation digital arts computer lab with 22”HD cintiq drawing surface and ergotron extension arm with 2d animation light-box drawing station. 10 private digital arts suites complete with 42” plasma preview monitor, large-format scanners, and 2d animation down-shooters for traditional hand-drawn animation. Natural sky-lit art studio, complete with 25 wood-bench stations for still art drawing or painting. Screening room with tiered seating and a 4k stereoscopic projection system with a Fuse DCP projection system. Multiple laptop bars and student lounge area, complete with full size couches and recliners. 1,500-square-foot directing stage, complete with 2k projection and ceiling grid lighting. Complete grab-and-go food service area. Outdoor patio with tables and seating. A full 65 blade render farm powered by both Quanta and IBM xeon-based computers. The render farm is located offsite at Marion Knott next door, but is tied into each and every station in the DMAC. Take a 360 degree tour of the Digital Media Arts Center from the comfort of your browser, compliments of Vego360.